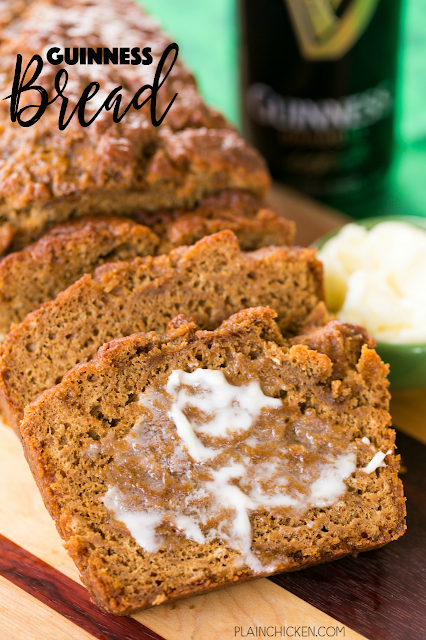 Guinness Bread - so easy and SO delicious! Ready to eat in an hour! Seriously THE BEST beer bread I've ever eaten!! Flour, baking powder, salt, sugar, molasses, Guinness beer and melted butter. Great for St. Patrick's Day!! This Guinness Bread is the BEST beer bread I've ever eaten. This is great for breakfast or an afternoon snack. We especially loved the bread slathered with some honey butter!! We love beer bread in our house. It is super easy to make; It only requires a few simple ingredients and is ready to eat in about an hour. LOVE easy homemade bread!! 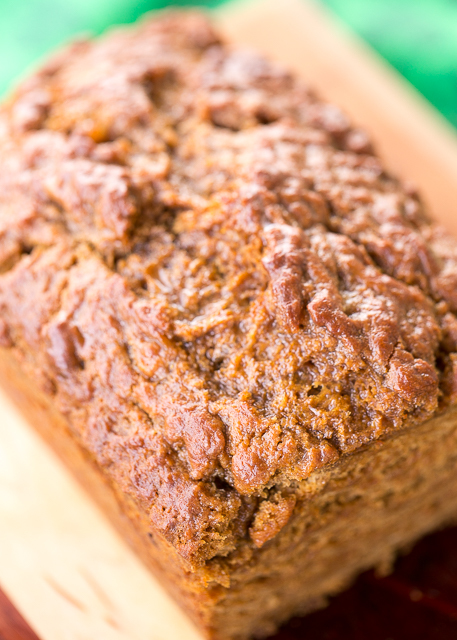 This Guinness Bread is a little different from my usual beer bread recipe. I added some molasses to give it a pretty "Guinness" color. The molasses added tons of great flavor in addition to the nice color. I used canned Guinness beer. It has the nitro cartridge in it and tastes like the beer right out of the tap. You can definitely use the bottled Guinness if that is what you prefer. Chicken Legs is a Guinness purists, so it is only cans in our house. Preheat oven to 350ºF. Spray a 9x5-inch loaf pan with cooking spray. Set aside. In a bowl, combine flour, baking powder, salt, sugar and molasses. Stir in beer, just until combined. Pour batter into prepared pan and pour melted butter on top of batter. Oh my goodness, that slice of break with the butter melting on it looks like pure heaven! I don't make bread a lot because I'll eat too much of it, but this is on my list to try!